Objectives Anxiety is an increasingly recognised predictor of cognitive deterioration in older adults and in those with mild cognitive impairment. Often believed to be a prodromal feature of neurodegenerative disease, anxiety may also be an independent risk factor for dementia, operationally defined here as preceding dementia diagnosis by ≥10 years. This systematic review used a rigorous methodology, with broad search terms and precisely predefined inclusion and exclusion criteria to investigate a life course association between a potentially modifiable risk factor, anxiety and dementia, while excluding anxiety related to preclinical dementia. Strict exclusion criteria were used to remove studies that did not either discuss anxiety diagnosis alone or control for depression, to account for high levels of anxiety–depression comorbidity. Study quality was formally investigated using the Newcastle-Ottawa Scale. The review was limited by the lack of assessment of cognition at baseline in retrospective studies; however, the length of look back minimises the likelihood of cognitive impairment at baseline. The small number and heterogeneity of study designs rendered a meta-analysis inappropriate; therefore, formal statistical analyses could not be performed. Dementia, and more specifically Alzheimer’s disease (AD), is a progressive neurocognitive disease. In the absence of any disease-modifying treatments, there is increasing focus on primary prevention to reduce the risk of its development and on early intervention to potentially slow progression. A better understanding of risk factors for dementia is therefore vital for improving therapeutic interventions. Alongside a number of well-described cardiovascular risk factors,1 increasing evidence has highlighted the association between psychiatric illnesses and the development of late-onset dementia.2 Further work is needed to understand whether these psychiatric symptoms and illnesses represent prodromal symptoms or act as independent risk factors. Although anxiety is a prevalent psychiatric disorder7 and commonly co-occurs with depression, the impact of anxiety on risk for cognitive decline and dementia has been far less studied. Anxiety symptoms are commonly experienced in the years preceding a dementia diagnosis8 and have been associated with cognitive decline and the progression from mild cognitive impairment (MCI) to AD.9–11 A recent review reported that anxiety and neuropsychiatric symptoms not reaching clinically diagnostic levels were associated with increased risk of dementia.12 The authors indicated that anxiety was likely a prodromal symptom of dementia in these community samples. This may well have been the case, particularly given the relatively short intervals between assessment of anxiety symptoms and assessment of dementia; however, this does not preclude anxiety also being a risk factor. The association between anxiety symptoms (independent of the dementia prodrome) and dementia in later life could more easily be investigated with longer intervals between anxiety assessment and dementia diagnosis, as the studies that have investigated this association within a 5-year to 10-year interval have reported variable results.13 14 The average length of prodromal preclinical cognitive decline has been proposed to be between 5 and 6 years,15 and individuals diagnosed with MCI may progress to AD within 5 years.16 Therefore, examining studies with at least a 10-year interval between anxiety assessment and dementia diagnosis would increase likelihood that anxiety is independent from the dementia prodrome. It is possible that anxiety symptoms meeting diagnostic threshold will have a stronger association with dementia than general symptoms because this has been shown with depression.4 To date, there has been no systematic review to investigate the association between clinically significant anxiety and dementia. The aim of this study was therefore to review the literature examining the association between clinically significant levels of anxiety and dementia risk over a longer time scale (≥10 years). 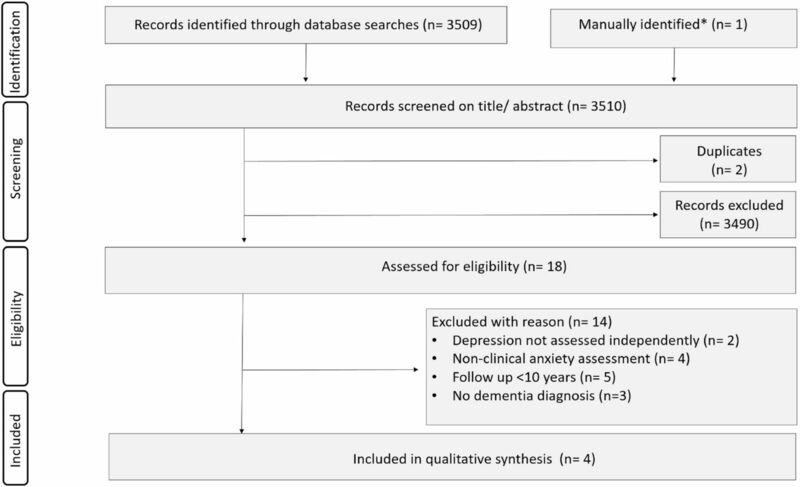 A systematic literature search of Medline, PsycINFO and Embase databases was conducted in articles published from inception to 8 March 2017 to identify articles reporting analyses of the association between anxiety (as defined by clinical diagnosis or self-report scales with a clinically significant threshold) and dementia or MCI incidence. Search terms used consisted of: (dement* OR Alzheimer* OR “mild cognitive impairment” OR MCI) AND (anx* OR “generalised anxiety disorder” OR GAD) AND (risk* OR odds), as presented in online supplementary table ST1. We aimed to identify articles discussing (1) diagnosis of any type of dementia, (2) anxiety diagnosis and (3) risk of dementia. The search was restricted to human studies and those published in English. Reference lists were searched for additional relevant articles. Searches were conducted by a single reviewer (AG). An independent review of all screened articles was conducted by a second reviewer (MS). Any disagreement was resolved by consensus with a third reviewer (NM), which occurred in two cases. Inclusion criteria were (1) a diagnosis of anxiety or an assessment of anxiety symptoms meeting diagnostic criteria using a standardised assessment tool, excluding populations with post-traumatic stress disorder or obsessive–compulsive disorder; (2) population-based studies where anxiety is assessed at least—on average—10 years preceding final clinical assessment for dementia in line with previous meta-analyses on depression using intervals of at least 10 years3; (3) a diagnosis of dementia using validated criteria (eg, Diagnostic Statistical Manual III–IV (DSM III–IV), International Classification of Diseases, 10th Revision (ICD-10)) and (4) late-onset dementia diagnoses (aged ≥65 years). Eligible articles were identified by performing an initial screen of titles and abstracts, followed by a full article review of those that passed screening. All retrospective and prospective studies that met these criteria were selected. Outcome measures related to anxiety and dementia diagnosis were independently extracted by two authors (AG, MS). Disagreements were resolved through discussion. Study design, sample characteristics (including educational level and age), follow-up length, dropout rate, anxiety (including measure and baseline score where appropriate), criteria for assessing dementia and measurements of depression as a confounder (including measure and baseline score) were recorded. In cases of insufficient data, authors were contacted by email. Two authors (AG, MS) independently assessed study quality and risk of bias using the Newcastle-Ottawa Scale, which contains separate quality assessment instruments for case–control and cohort studies. Characteristics of the four selected studies are shown in table 1. Clinically significant anxiety was documented based on clinical diagnosis using ICD-10 criteria (n=2), the State Trait Anxiety Inventory (STAI, n=1) and a subscale of the State Trait Personality Inventory (STPI, n=1). Gallacher et al 20 measured anxiety using the STAI, which has a range from 20 to 8022 and is a validated measure for assessing anxiety symptoms. A clinically significant cut-off of 39–40 has been proposed.23 24 Gallacher et al 20 categorised ‘high anxiety’ as having a STAI score between 35 and 72, compared with a ‘low anxiety’ group who had a STAI score between 20 and 34. Boot et al 19 and Zilkens et al 18 used ICD-10 criteria to diagnose an anxiety disorder. Petkus et al 21 assessed anxiety using state anxiety subscale of the STPI, which contains a subset of items from the STAI. Participants scoring at least 1 SD above the population mean, equating to a score of ≥25 out of 40, were categorised having ‘high anxiety’. Although there is no established cut-off for clinically significant anxiety using this scale, scores >1 SD above the population mean are likely to represent a group with a high anxiety symptom burden. After discussion among the reviewers (AG, MS, NM), we reached a consensus judgement that the study was suitable for inclusion in this review. Sample sizes of the studies ranged from 441 to 27 136 participants, recruited from both or either community and hospital inpatient/outpatient populations. Gallacher et al 20 and Petkus et al 21 conducted prospective cohort studies using a community population that excluded dementia at baseline, the latter focused on twins. Zilkens et al,18 and Boot et al 19 conducted matched case–control studies, which retrospectively analysed community and hospital records of individuals with dementia or case-matched controls for anxiety diagnosis and therefore did not include a cognitive assessment at baseline to exclude dementia. Zilkens et al 18 drew controls from the electoral roll, whereas Boot et al 19 drew them from the community-dwelling persons included in the Mayo Clinic Study of Aging. The proportion of women in each study ranged from 0% to 56.6%. Educational level was recorded for all but one study, and ranged from 55% with no qualifications to 95% with >9 years of education. All studies included in this review found a significant increase in the number of dementia diagnoses in patients who had a clinical anxiety diagnosis or experienced clinically significant anxiety symptoms on average at least 10 years prior to their diagnosis of dementia; Zilkens et al 18: OR=1.61 (95% CI 1.28 to 2.02), Boot et al 19: OR=7.4 (95% CI 3.5 to 16), Gallacher et al 20: OR=1.62 (95% CI 0.59 to 4.41) and Petkus et al 21: OR=1.48 (95% CI 1.01 to 2.18), respectively.18–21 On the whole, retrospective studies that looked back for lifelong diagnoses of anxiety found a stronger association between midlife anxiety and later dementia diagnosis than prospective studies investigating an association over a shorter time period. Additionally, Petkus et al 21 demonstrated that the association between high anxiety and dementia diagnosis remained when they excluded participants who developed dementia within 5 years of the baseline assessment. This subsample had an average interval between baseline and dementia diagnosis of 14.7 years (SD 6.7 years). Both lend support that the associations found were independent of prodromal dementia symptoms. Each study controlled for a range of demographic factors, and all controlled for vascular and other psychiatric risk factors (tables 2 and 3). All studies assessed and controlled for depression symptoms in their analysis. Boot et al 19 found a stronger association between anxiety diagnosis alone with future dementia than either depression diagnosis alone or mixed anxiety and depression diagnosis, although the number of individuals with anxiety was markedly larger than those in the other two categories (anxiety alone n=168; depression alone n=52; anxiety and depression n=56). Although Zilkens et al 18 assessed a range of psychiatric diagnoses including anxiety and depression, they did not assess their interaction. Petkus et al 21 and Gallacher et al,20 while controlling for depression, made no assessment of the comparative strength of relationship or their interaction. Three of the studies had representative samples of community populations; the fourth led by Gallacher et al 20 included only men. All controlled for a range of both demographic, physical and psychological health factors. All outcomes were assessed either via secure health records or independent validation. Gallacher et al 20 experienced 20% loss to follow-up, which compares favourably to the prementioned Cherbuin et al 4 review, which considered studies with an attrition rate of between 4.3% and 55.46% and a review of MCI drug studies with attrition rates varying from 12% to 49%.27 Petkus et al 21 did not clearly report lost to follow-up. For both case–control studies, the primary care records did not include a cognitive assessment at baseline. Therefore, pre-existing cognitive impairment before diagnosis cannot be ruled out, although long look-back periods make this less likely. This systematic review found four high-quality studies that all showed a positive association between clinically significant anxiety and risk of late-onset dementia over a mean interval of at least 10 years from anxiety assessment to dementia diagnosis, even after accounting for potential confounders. This important finding provides further evidence that a common mental health condition in midlife is associated with later life neurodegenerative disorders. Anxiety symptomatology has previously been related to dementia risk and cognitive decline, although not conclusively.10 28 A recent systematic review reported a positive association between anxiety symptoms and dementia diagnosis over a short-time interval.12 In that review, the majority of studies reported follow-up periods between 2 and 3.8 years. A single study had a follow-up time of up to 11.8 years; however, the average interval between anxiety and dementia diagnosis may have been less than 10 years, therefore, it was not included in the current review.13 Gulpers et al found stronger associations with smaller intervals between assessment of anxiety and dementia diagnosis. As a result, the authors concluded that anxiety may result from a prodromal state of dementia, where an increase in anxiety may be due to an individual’s insight into their early subjective experience of cognitive decline.12 Given the short-time interval between assessments, Gulpers et al were unable to determine whether anxiety could also serve as an independent risk for dementia. This review reports solely articles that were not included Gulpers et al’s analyses and therefore furthers their work by providing an independent assessment of the anxiety–dementia association. Effect sizes of the studies included in this review (1.48–7.4) were comparable to the overall effect size found by Gulpers et al 12 of 1.61, suggesting that the association between clinically significant midlife anxiety and later life dementia is as strong as that between late-life anxiety symptoms and dementia. The prodromal phase of dementia can begin several years before objective dementia is manifest. In the present review, we sought to minimise the potential influence of preclinical cognitive decline by including only studies that assessed anxiety and dementia diagnoses over an extended period. Three studies18 20 21 demonstrated a mean interval of at least 10 years between the anxiety and dementia evaluations. Boot et al 19 analysed participant’s lifelong medical record; however, the mean interval between anxiety and dementia diagnosis was not reported. It has recently been suggested that a longer interval period between anxiety and dementia diagnosis may provide evidence for a common biological pathway linking anxiety, depression and dementia.20 An abnormal stress response, such as exhibited in anxiety disorders, may be associated with accelerated cellular ageing and neuroprogression (a pathological reorganisation of the central nervous system) resulting in increased neurodegeneration, neuronal apoptosis and lowered neuroplasticity.31 Although glucocorticoid, inflammatory mediator and vascular disease mechanisms are hypothesised,3 32 as yet, no convincing candidate biological mechanism linking anxiety and cognitive impairment exists. Whether reducing anxiety in middle age would result in reduced risk of dementia remains an open question. The effect of treatment of anxiety using pharmacological and non-pharmacological therapies during midlife on later risk for dementia has not yet been investigated. Benzodiazepines, commonly used in the treatment of anxiety, have been shown to increase risk of mortality in some groups35 and therefore cannot be considered a measure to reduce dementia incidence in those with clinical anxiety. It is possible that diverse non-pharmacological therapies, including talking therapies36 and mindfulness-based interventions and meditation practices,37 that are known to reduce anxiety in midlife, could have a risk-reducing effect, although this is yet to be thoroughly researched. Given the high prevalence of anxiety seen in primary care, we suggest that general practitioners could consider anxiety alongside depression as an indicator of risk for dementia. To improve the rate of earlier diagnosis of dementia, close monitoring of subtle cognitive decline in older adults with a history of anxiety, depression and cerebrovascular disease would be encouraged. This review expands our understanding of anxiety as a potentially modifiable risk for dementia. Given the limited number of studies investigating the anxiety–dementia relationship, further research is required to assess underlying mechanisms that link these disorders and to disambiguate anxiety’s potential role as a risk factor as separate from a prodromal symptom of dementia. We thank Dr Bradley Boeve (Mayo Clinic College of Medicine, Rochester), Dr Claire Burton (Keele University) and Dr Andrew Petkus (University of Southern California) for providing clarification of articles screened for inclusion in support of this work.
. Epidemiology of anxiety disorders in the 21st century. Dialogues Clin Neurosci 2015;17:327–35. Centre for Reviews and Dissemination. CRD’s Guidance for undertaking reviews in health care, 2009.
. Manual for the State-Trait Anxiety Inventory, 1983.
. The Newcastle-Ottawa Scale (NOS) for assessing the quality if nonrandomized studies in meta-analyses. 2012 http//www.ohri.ca/programs/clinical_epidemiology/oxford.asp. Contributors AG contributed to design of the study, data screening and extraction, drafting of the manuscript and submission. MS contributed to literature search, data screening and extraction and manuscript preparation. JDH contributed to the study design, provided methodological expertise and editing of the manuscript. NLM contributed to the conception and study design, data interpretation and editing of the manuscript. Funding This work was supported by a grant from the British Geriatrics Society. NLM was supported by University College London and Alzheimer’s Society (AS-SF-15b-002).